Installing and using a smart strip can be a great way to save money on your monthly electric bill. While this isn’t true of most new electronics, it’s quite common for older electronic devices to draw energy while they’re in both standby mode or “powered down”. This is commonly referred to as either a “phantom load” or “vampire power“. In some cases, vampire power can add as much as 10% to your monthly electric bill. Just follow these easy steps to install a smart strip and start saving on your electric bill. 1. Plug your smart strip into an open outlet. This will provide power to the smart strip so that it can actively save you money without drawing much, if any, power itself. 2. 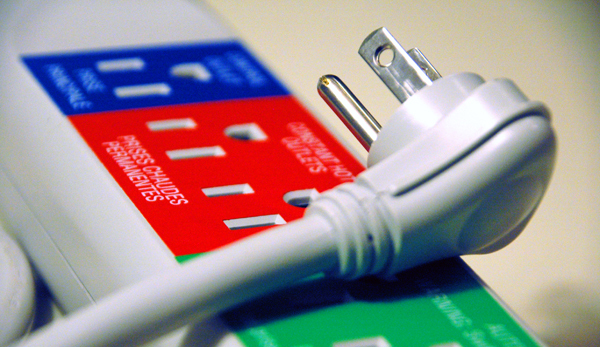 Plug the devices that always need to have power into the outlets labeled “constant” or “hot outlets”. These outlets should be clearly labeled on your smart strip. It’s not always necessary, but sometimes an electronic device will need to be constantly drawing power. 3. Plug your TV or main electronic device into the “control outlet”. An electronic device that is plugged into this outlet will control the power to all of the other outlets labeled “switched outlets” or ” automatically switched outlets”. When the device that is plugged into the “control outlet” goes into a standby mode or is turned off, the smart strip will register the change in power and automatically reduce or eliminate the power to all of the “switched outlets”. This effectively allows you to power down an entire entertainment system by simply turning off one device. 4. Plug your remaining electronics into the outlets labeled “switched outlets”. As mentioned before, the power to these outlets will be determined by the “control outlet”. A good example of devices to be plugged into these outlets are stereos, printers, scanners or other electronics that are used in conjunction with another electronic, such as your TV, computer or gaming system. Your smart strip should now be plugged in and ready to start saving you money. Give it a test and try turning on the device plugged into the control outlet. Do the devices plugged into the “switched outlets” now have power? What about when you turn off the control device? If you’ve installed the smart strip properly, turning off the control device should power down the devices plugged into the “switched outlets” as well. If you’re looking for more ways to save on your electric bill, try installing a water efficient shower head or a shower flow valve adapter. These devices will help reduce the amount of heated water you use, thus saving you on both your energy and water bills every month! Also, be sure to check out more of our green home improvement projects: Green Living Ideas, after all, is a top 20 home improvement website! Photo courtesy of N.C. State University.